1. Sign Immediately - As soon as your card arrives in the mail, it is recommended that you sign the back. 2. Memorize your PIN - Don't write your personal identification number (PIN) down and carry it with you. Leave the number at home. 3. Thank You For Asking - Tell merchants thank you for asking to see your identification or verifying your signature when making purchases with your debit/credit card. This verification process is intended to protect your card from fraudulent purchases. 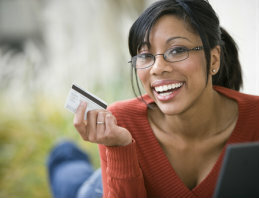 When using your card for purchases, make sure the merchant returns it to you and that it is your card. 4. Take Your Receipt and Save It - Always ask for your debit/credit card receipts when making purchases and tear up any carbon copies. Reconcile your receipts against your monthly statement to verify any suspicious activity. Report any unauthorized transactions immediately. Once you have reconciled the statement, you can tear up the receipts if you want. But do it in the safety of your own home. 5. Verify Statements - Review your monthly statements carefully to assure the amounts charged are what you authorized. Report any errors or unauthorized transactions immediately. 6. Keep It Private - Store your statements in a safe place. 7. Out of Sight - Never leave your purse or wallet unattended and always keep your debit/credit cards out of sight. 8. Lender's Regret - Never lend your debit/credit cards out. Your debit/credit card is your responsibility. Be sure you keep track of where all your cards are located. 9. Keep A List of Contacts - Write down your account numbers and telephone numbers to contact if your cards should be lost or stolen. 10. Report Immediately - If cards are lost or stolen, you should report it immediately, no matter where you are, to minimize loss and liability.